I, along with about 1/3 of women, suffer from endometriosis. As I write Regency historical romances and I work for a surgical association, I began to wonder what my life expectancy would have been, given how serious my endometriosis is, back in the 1800’s. I came to the conclusion I would probably have been dead by forty-five, and for the last seven years of my life I would have been very ill. I got to wondering was endometriosis understood in the early 1800’s and what was the treatment? Can you imagine how the doctors would conduct examinations? The historic taboo associated with the examination of the female productive organs and genitalia has long inhibited the science of gynaecology. This 1822 drawing by Jacques-Pierre Maygnier shows a “compromise” procedure, in which the physician is kneeling before the woman but cannot see her genitalia. No wonder misdiagnosis was rampant. This is what I managed to research. The abdomen was first deliberately opened to remove an ovarian cyst by Ephraim McDowell in Kentucky in 1809. There is no mention on whether the lady survived and it is interesting to see it was done in the USA not England. The first abdominal hysterectomy was not performed until 1843 by Charles Clay in Manchester, England. 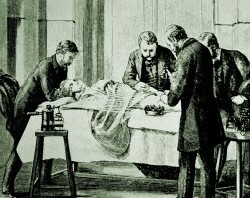 His claim to the title Father of Ovariotomy is now generally conceded, and it is admitted that he deserves the credit not only of having shown how that operation could be made a success, but also for having played an important part in the advance of abdominal surgery, for which the 19th century was conspicuous. in 1843, he first performed the operation of ovariotomy with which his name is associated. On this occasion it was perfectly successful, and when in 1865 he published an analysis of his cases, he was able to show a mortality only slightly above 30%, which was very good in this era. Did you know that vaginal hysterectomy dates back to ancient times? The procedure was performed by Soranus of Ephesus 120 years after the birth of Christ, and there were many reports of its use in the middle ages, but the patients rarely survived. The early hysterectomies were fraught with hazard and the patients usually died of haemorrhage, peritonitis, and exhaustion. Early procedures were performed without anaesthesia with a mortality of about 70%, mainly due to sepsis from leaving a long ligature to encourage the drainage of pus. Thomas Keith a Scottish trained surgeon (around 1855) realized the danger of this practice and merely cauterized the cervical stump, thereby bringing the mortality down to about 8%. Thomas shared a practice in Great Stuart Street, London with his brother George Skene Keith; both were members of Sir James Young Simpson’s team that pioneered the use of chloroform as an anaesthetic. He was also Lady Randolph Churchill’s physician. What my research uncovered was that if I’d been born in the Regency period, I very likely would have had a miserable and short life. Even during the early Victorian period I would most likely have had a terrible quality of life, and by the mid to late 1800’s I would have had to have been a very brave , or desperate woman to undergo any form of gynecological surgery. Thank goodness for surgical advances. My latest release, A Whisper of Desire, book #4 in my Disgraced Lords series, sees my heroine undergoing surgery for a wound to her womb, and I must admit I took a liberty and ensured she survived her ordeal. PLUS I’m excited to share that A WHISPER OF DESIRE made it to the FINAL round in The Romance Reviews Reader’s Choice Awards in the Historical Post-Medieval category. only to save me a bit of embarrassment of no votes! Click here to vote if you read the book and enjoyed it.